Hiral Sanghavi has killed it with crowdfunding. He’s raised more than $11.5 million for a travel jacket that has all sorts of nifty features including an inflatable neck pillow and a koozie drink pocket. Through his blockbuster campaign, which ran on both Kickstarter and Indiegogo, Sanghavi sold 65,000 jackets to 45,000 customers in 120 countries around the world. Yesterday, his Seattle-based company, BauBax, which he runs with his wife Yoganshi Shah, launched a second product line with crowdfunding. The company's new wearables include a dozen and a half interchangeable pieces that contain wireless smartphone charging pads. Among the products they plan to sell are standalone pads, as well as shorts than feature a charging pad in the back pocket and a clutch handbag with one inside. 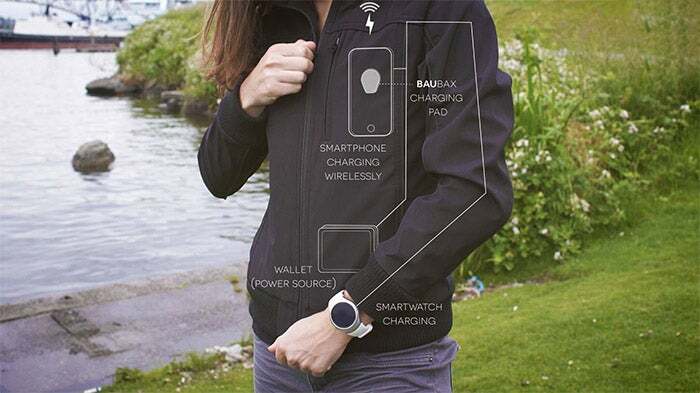 The BauBax wearable apparel line depends on the technology embedded within Android and Microsoft phones called Qi (pronounced “chi”) whereby a smartphone can charge wirelessly. Apple's iPhones don’t have the same Qi technology, so as a workaround, BauBax sells an iPhone case that contains it. 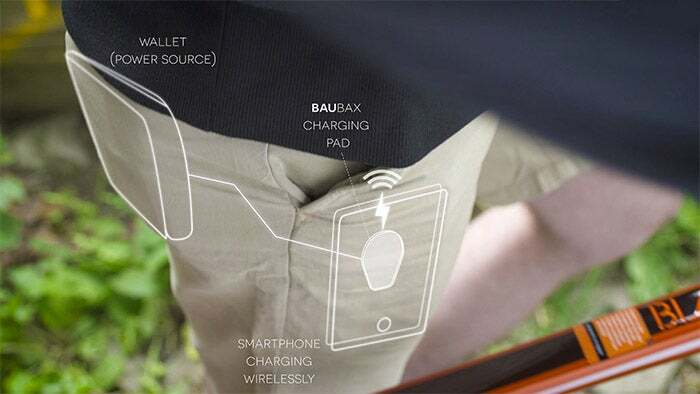 The wireless charging system is powered by a battery that users carry in a custom wallet. 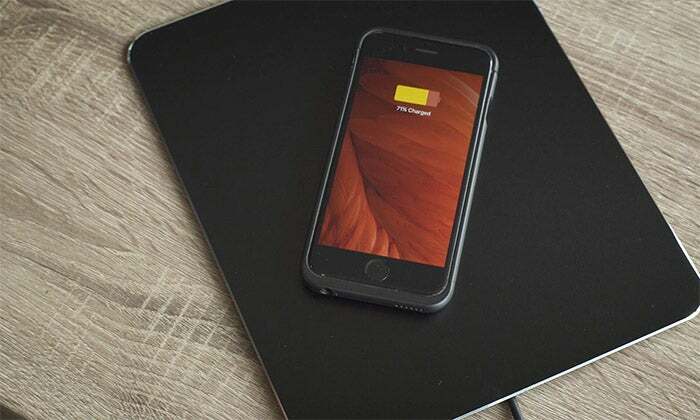 Component pieces of the wireless charging ecosystem range from $40 to $300 at retail, but they are available for a discount from $15 to $169 through the Kickstarter campaign. Now that BauBax has some serious traction, why is it bothering to crowdfund again? This second crowdfunding campaign is shooting to raise $100,000. 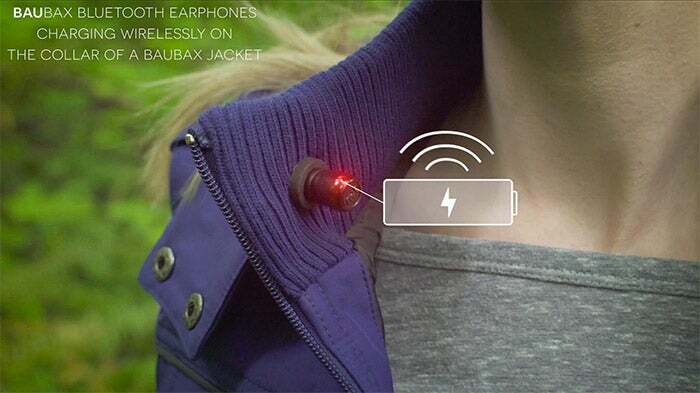 That’s millions shy of the multi-million-dollar crowdfunding success of the travel jacket. But BauBax doesn’t actually need the money. It’s got $100,000 cash in the bank. The priceless benefit of crowdfunding is that it gives Sanghavi access to real-time feedback from potential customers. He can learn about customers' interest in various elements of the ecosystem before going into production. And as a bonus, the $100,000 raised will cover the cost of manufacturing molds for the wireless charging apparel line. Further, raising money with donation-based crowdfunding, as Sanghavi has on both Kickstarter and Indiegogo, does not require him to give away equity to investors. That’s a major selling point and one that Sanghavi says will make angel investing increasingly less desirable to companies looking to raise money. “Angel investing is something that I believe you can completely get rid of with crowdfunding,” Sanghavi says. “Angels come at the seed stage and crowdfunding literally has the ability to kill it." 1. Build in time for unexpected production delays. The first BauBax travel jackets shipped four months late. Part of the reason for the delay was because the BauBax team expected to raise only $20,000. They raised $9.2 million on Kickstarter and another $2.3 million on Indiegogo. That meant that BauBax had to manufacture a whole lot more jackets than it had been expecting to sell. “We ended up working with 10 factories instead of three that we originally planned,” Sanghavi says. Also, Sanghavi, who lives in Seattle and is from India, didn’t know about the Chinese New Year celebration in February. The entire country pretty much shuts down during the celebration, and that added an unexpected delay to the production process. Then there were further delays when BauBax imported the jackets from China. 2. Communicate obsessively with campaign backers. The BauBax team had to field a number of complaints from customers who were upset that their travel jackets weren’t delivered on time. Sanghavi says he understands their frustrations. Perhaps they had bought the jacket as a holiday present and because of the manufacturing delays, the jacket wasn’t ready in time. He also suspects that some of the frustration on the part of campaign backers was that they had higher expectations of a startup utilizing crowdfunding. Of the 45,000 backers BauBax had on Kickstarter, 40 percent of them were first-time crowdfunders. Going forward, Sanghavi says that he will be exceptionally clear with crowdfunding backers. Campaign backers who ordered a jacket to be shipped to them internationally also faced customs duties. In some cases, those taxes can be expensive. For example, for Canadian customers, the import taxes are 40 percent. On a $150 jacket, that’s almost $60. Sanghavi says that going forward, he will be clearer with customers to let them know that they will be expected to pay any and all import taxes. 3. If you do mess up, compensate your backers. Let them know you care. In an effort to communicate his regret for the four-month delay to his backers, Sanghavi included a free water foldable water bottle with each jacket delivered. Each water bottle cost about $3, Sanghavi estimates, including manufacturing, delivery and inventory storage costs. For 65,000 jackets delivered, that’s nearly $200,000. That’s a lot of money for any startup, but Sanghavi says he has no regrets. There’s no way to know if that water bottle giveaway tipped the scales for customers, but in the end, only seven percent of campaign backers reported being dissatisfied. That’s a percentage that Sanghavi says he can live with.